With our cities becoming increasingly more populated green walls, also known as living walls, can provide a viable solution to the spatial problem that faces contemporary architecture in today’s environment. A sneek peak at Kevin Dennis' garden entry at Bloom. Perfect for indoor and outdoor vertical gardens. Maximises space and style, for beautiful results. 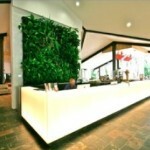 Our living green walls provide a vertical garden for both interior and exterior design. We have two models for you to choose from, first is our most popular choice which is the modular model and second is our bespoke model which is customised to meet the clients specific green wall requirements. Both models are produced from the highest quality materials and are suitable for private and commercial installation. For each of our models we also provide a management programme to help you select the correct plants that will make the best impact with your new green wall. 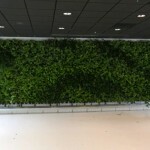 Where you plan to install the green wall, the particular surface you want it on will determine what plants will be suitable for it, our team will work with you to select the best plants to insure that you or your client will get the most out of the living wall. 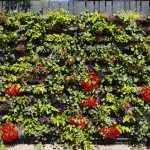 After the plants have been selected we can install the green wall for you in a matter of hours. The soils we use in our green walls contain Compost tea and Biochar, these are natural organic fertilisers which work perfectly with all plants. Our process results in a superior product and is the perfect blend of sustainable green technology and nature that will produce a beautiful, healthy and lustrous living wall for both indoors or outdoor environments. In any area, large or small, our green walls will transform any vertical space, enhancing your home and giving your business a competitive advantage. We will provide you with information before and after the sale and all you have to do is contact us and we will be delighted to help you. 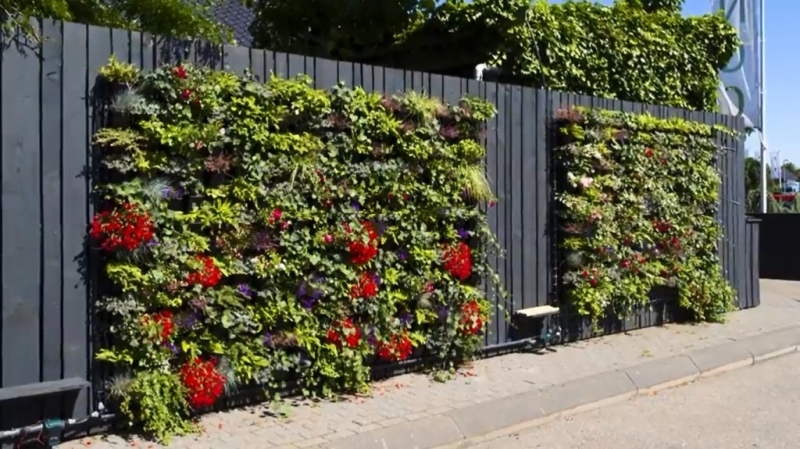 If you are interested in purchasing a living wall for your home or business you will not find a better option that blends the latest technology with beautiful design and the most advanced soil mixtures then here at Landtech Soils. 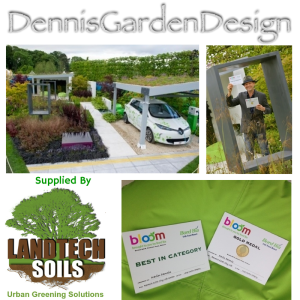 Both our green wall and green roofs products were used in Kevin Dennis’s award winning garden at bloom 2014. See the video below for more information. Irrigation is the most important factor for vertical gardens as they may be in an area where rainfall might not be available. Also busy lifestyle may not provide them with the time to water the plants. For this reason our green walls have a optional automatic irrigation system that provides the plants with the right quantity of water when they need it, this is done by utilising an automated water drip system. 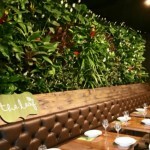 Our green walls can be placed indoors and out where suitable plants will thrive in both environments. Below you can see our model choices and if you like any of these we look forward to hearing from you. The planters in this system are moulded with hooks on the back. The compost and water are separated by a water absorbent membrane. Each planter has a facility for automatic Irrigation to be used. The planters are attached to the side of a wall using weldmesh 50 X 50 X 3mm and a support frame on the wall. A separate waterproof barrier should not be required. Our BESPOKE System leaves a useful air gap. Using automatic irrigation enables the Bin Fen system to function without wasting water. Each plant is growing in its own planter with its own water supply, this also means each plant’s particular soil requirements can be catered for, which gives the designer full control over the selection of plants for colour shape and size as well as flowering times, plants can also be easily changed. The unique design is easy to understand. The basic element consists of a frame with 5 openings, into which you place a specially designed flower pot. Each flower pot can be automatically irrigated. The frames are fitted with a ball and socket and can therefore be connected to each other as a ball joint. These flexible connections can be used to create free standing, decorative walls or objects. This system can also be used to attach the frames to carriers on a wall, enabling the carriers to be attached very precisely to the wall. No separate waterproof barrier layer is required. 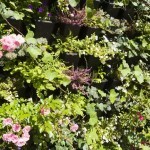 Due to the automatic irrigation, the Bin Fen Green Wall System does not waste any water. Each plant grows in its own flower pot with its own water supply. If necessary, a plant can also be given special feed or soil. The garden architect is thus free in his/her choice of plants. Furthermore, the plants can easily be changed once they have finished flowering or when new colours, shapes and/ or sizes are required. Green walls can be created within the house or outside and be seamlessly integrated into its surroundings. 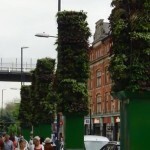 These are partially or completely covered with vegetation creating a living wall, in some cases, soil or an inorganic growing medium can be utilised for the desired effect. Helps alleviate sick building syndrome. We distribute Green Walls to Tipperary, Nenagh, Portumna, Birr, Roscrea, Templemore, also in Dublin, Cork, Wexford, Waterford, Kilkenny and to every county in Ireland. We also provide Green Walls in Berkshire, Buckinghamshire, East Sussex, Hampshire, Kent, Surrey, Oxfordshire and West Sussex, London as with the other regions of England. So please feel free to call us for a quote.